A single filter that uses a combination of filter primitives. 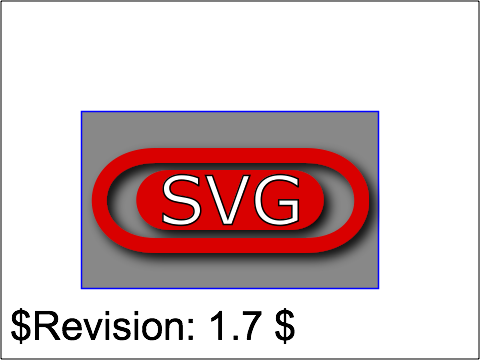 You should see a gray rectangle that contains a red outer ring and a red inner button with "SVG" on it, both having a 3D appearance. Verify that a typical usage of filtering is operation. This test case creates a 3D lighting effect and requires that several filters are working: feGaussianBlur, feOffset, feSpecularLighting, feComposite and feMerge. 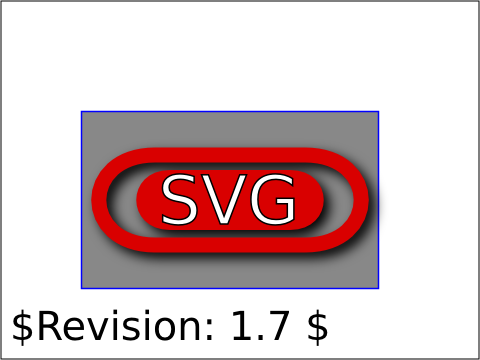 The graphic consisting of the string "SVG" sitting on top of oval filled in red and surrounded by an oval outlined in red. The test uses a nested 'svg' element, 'rect' element, 'path' element, as well as basic fill (solid colors), stroke (solid colors with stroke-width lines), font-family (Verdana and Arial) and font-size properties.